Hot summer days call for cool and refreshing treats! 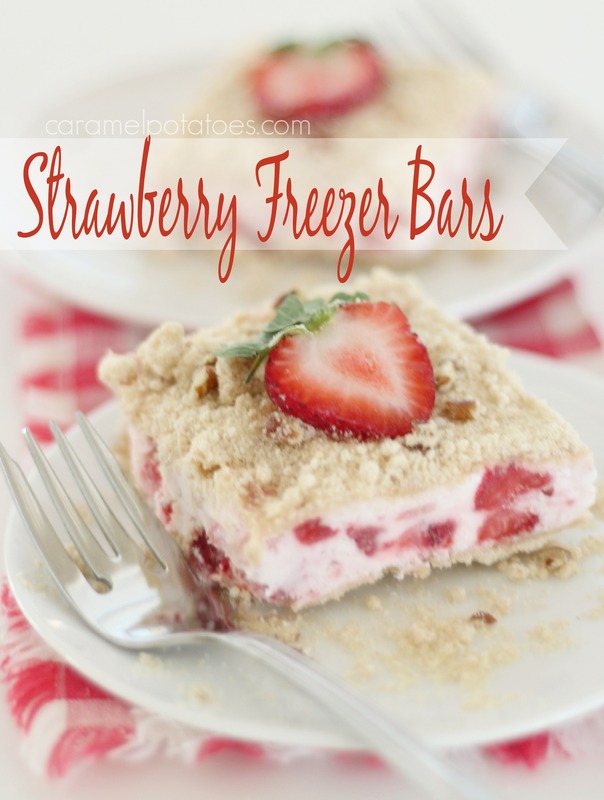 These Strawberry Freezer are packed with summer flavor and literally melt in your mouth. This vintage recipe reminds me of church potlucks and summer fun! What a delicious way to beat the heat! If you need more no-bake goodies to keep you cool, try our No-bake Oreo Cheesecake, Orange Creamsicle Pie, Strawberry Pretzel Ice Cream Pie, Grasshopper Ice Cream Pie, or you can never go wrong with Chocolate, Vanilla Bean, or Strawberry Cheesecake Ice Cream! Line a rimmed baking sheet with foil. In a bowl, stir together the flour, brown sugar, nuts and melted butter. Toast the mixture in the oven about 15 minutes or until the walnuts are fragrant the mix is lightly brown. Stir occasionally. Sprinkle 2/3 of the mix evenly over the bottom of the 9×13 pan. In a large bowl, whip the egg whites with the lemon juice until they can hold a soft peak. Gradually add the white sugar while continuing to whip to firm peaks. Fold in the strawberries. In a separate bowl, whip the cream with an electric mixer until stiff peaks form. Fold the cream into the strawberry mixture. Spoon over the crust in the baking dish and spread evenly. Top with remaining nut and flour mixture. Freeze overnight or at least 6 hours. Allow to set out 5 minutes before serving.